While the COP24 climate talks are at risk of ending without a concrete plan of action thanks in large part to the Trump administration’s commitment to a dirty energy agenda, environmental groups on Thursday celebrated a major milestone in the global movement to take down the fossil fuel industry after the number of public and private institutions that have vowed to divest from oil, gas and coal companies surpassed 1,000. According to 350, the institutions that have committed to divesting from fossil fuels hold nearly $8 trillion USD in combined assets. The 1,000th institution to vow to divest was Caisse des dépôts et consignations (CDC), which manages France’s public sector savings, pensions and investments. Coinciding with the new milestone, 350.org published a new report (detailing the rapid growth of the fossil fuel divestment movement over the past several years as climate science has made clear the necessity of immediately and boldly slashing carbon emissions to avoid global devastation. “Momentum for divestment has only accelerated: pledges span 37 countries with over 65 percent of commitments coming from outside the United States, and now include major capital cities, mainstream banks and insurance companies, massive pension funds, faith groups, cultural, health and educational institutions—the institutions serving billions of people,” the report continues. 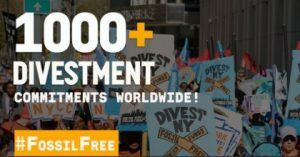 With the 1,000 institution landmark reached, 350 said the global movement’s next ambitious goal is 2,020 divestments totaling $12 trillion in combined assets by 2020.